Remington is America’s oldest gun maker. «Model 700», perhaps is the most popular hunting and sniper rifle in the USA since it was first introduced in 1962s. «Remington» also served as the model for military rifles “M40”, officially adopted by the US Marines. This game set produced by Laserwar© is the safe alternative for a real combat gun. This gun has a plastic gunstock with rubber points in the shoulder rest. The receiver and barrel are made from aluminum alloy. On top of the breech casing, this gun has 20mm Picatinny rail for mounting optic sights. As a power source, this laser tag gun uses a lithium battery with 2.2 Ah capacity, providing up to 30 hours of battery life. «Remington» is a manually operated bolt action rifle with a smooth breech lock. It is activated by unlocking the vandal-proof lock, located on the bottom of the foregrip. Safety lock performs its usual functions. Remington «M700» laser tag sniper gun has an optimal shooting range of 820ft (250m), and maximum range of 1300ft (400m). Long range is the main feature of this game set. 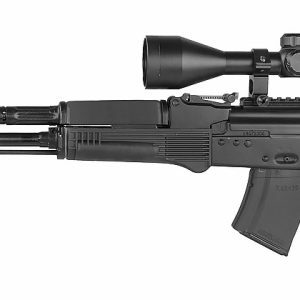 Specifications are close to a real rifle with a length of 48 in (127 cm), weight of 7 lb (3.2kg) and a bipod included as standard option. This laser tag sniper rifle is a top choice of elite snipers, the “Remington Original” laser tagger is unequaled in tactical precision.